Prepare, measure, price and output final account. Output final account as a remeasured bill or as a schedule of additions and omissions. A series of items can be omitted with a single click. Detailed cross reference back to the bills. Addition of new, non-bill items with star rates in the final account.hmarks. Standard take off functions are present. Elemental cost analysis of final account. Setup basis of final account. Check the net contract sum for each package in the project. Select whether to include in Progress Payment Valuations. The “Measuring list” is the first entry point for measurement of a new final account item. This window shows the current data position for the project as modified by all final account items. 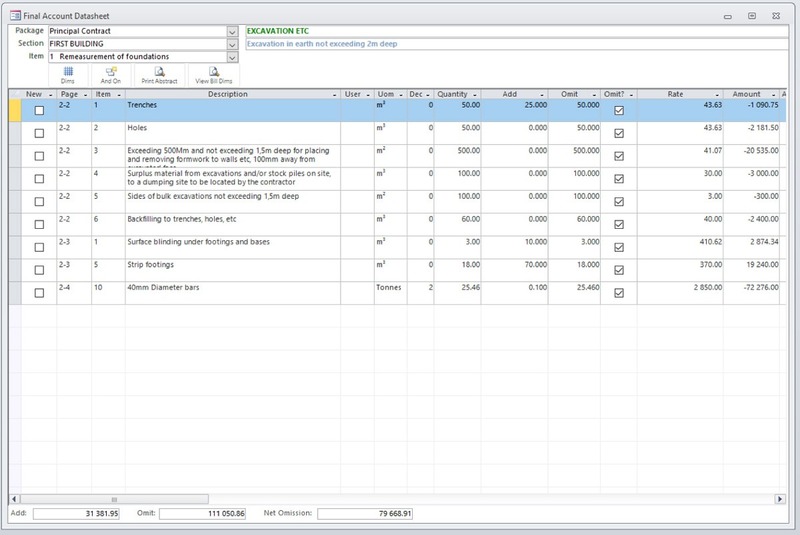 Original bill quantity, contract rate, bill page and item number are visible against each item. Items not in the original bill may be added from the library. 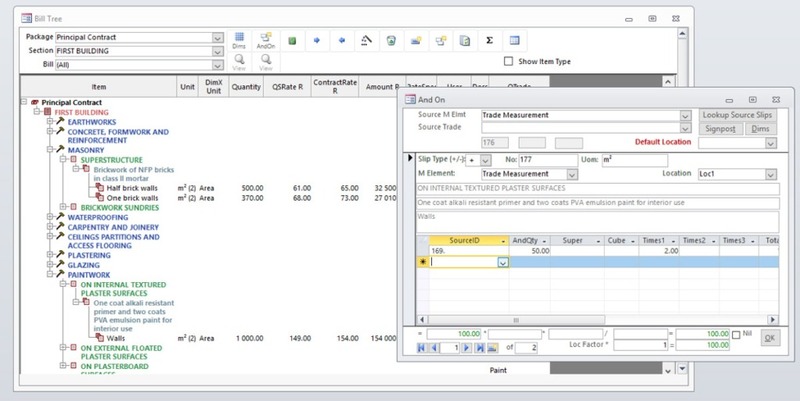 “Add quantity”, “Omit quantity”, “Total adjusted quantity”, “Rate” and “Amount” are shown. 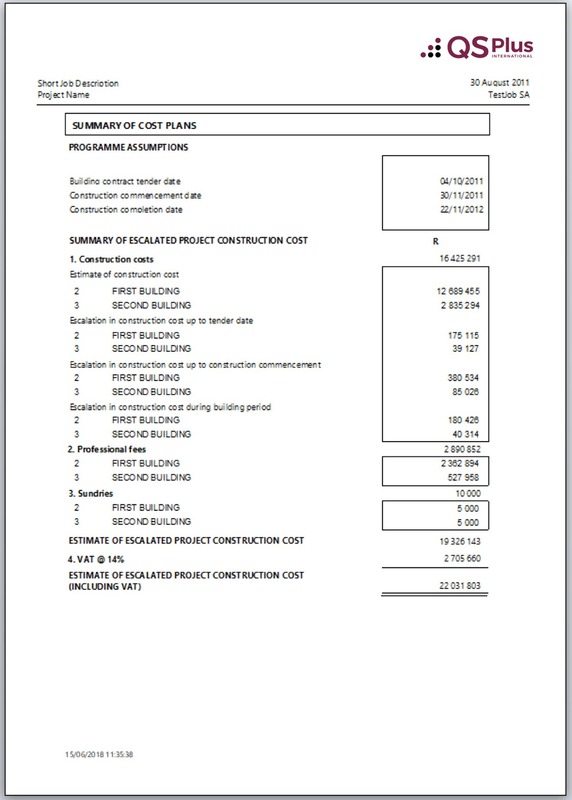 Each dimension sheet carries the related final account item description for clarity. The data sheet will allow you to see all the items measured in a specific final account item. This window shows the net effect of a single final account item. 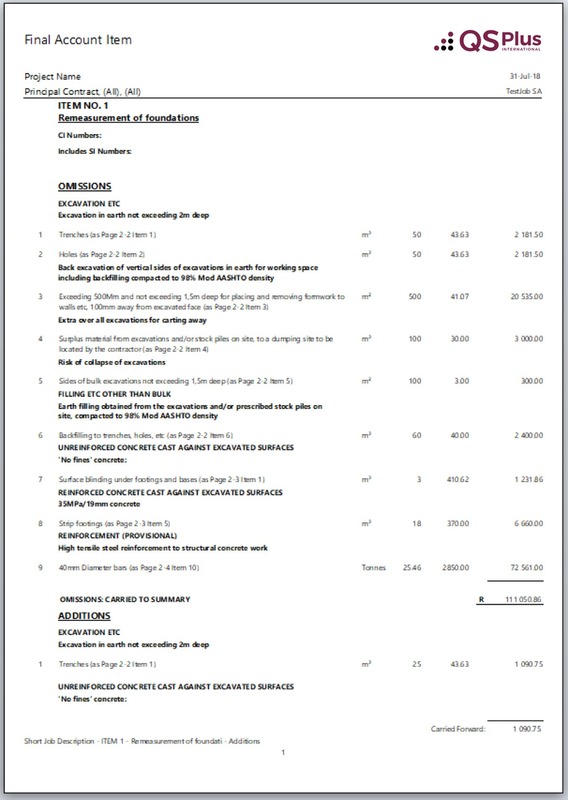 “Original bill quantity”, “Contract rate”, “Bill Page” and “Item number” are visible against each item. “Add quantity”, “Omit Qqantity”, “Total adjusted quantity”, “Rate” and “Amount” are shown. Only dimensions for the selected final account item will be visible from this window. Bill data may be imported as additions. Excel spreadsheet of remeasured bills. 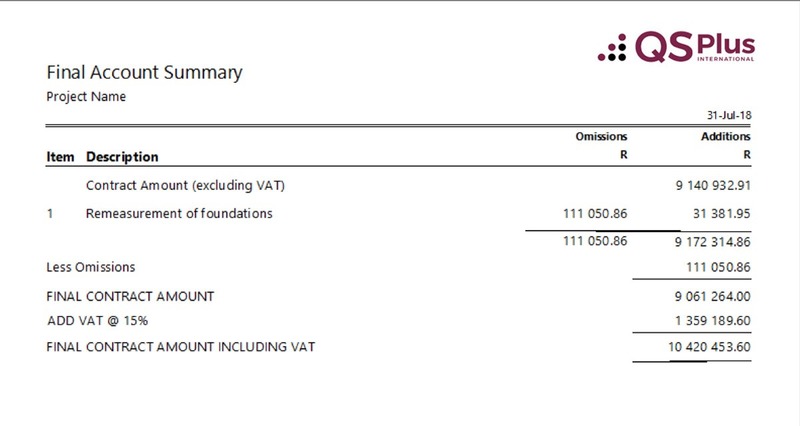 Print an elemental cost analysis of the final account using a window which allows you to check the element allocations against each measured item. The output includes elemental quantities and rates per element or per section”, for the project. Addition of new, non-bill items with star rates in the final account. If locations are present against the relevant section, all measurements must reference a particular location. Any number of measurements may be entered for any number of locations. QSPlus International is fully integrated with DimensionX, the on-screen take-off program. 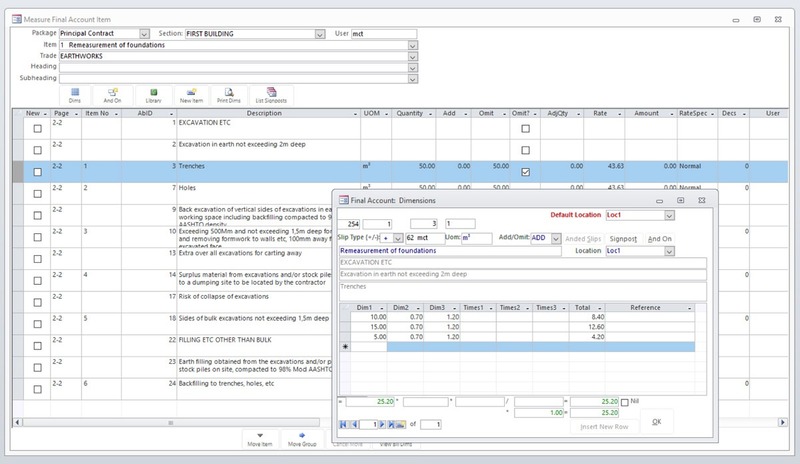 Any measurements you make in DimensionX are automatically assembled into your QSPlus International project for linking to bill items via an easy-to-use and fully comprehensive interface window. Any changes you make to measurements in DimensionX will automatically cascade update their quantities to your project. Any measurement which came from DimensionX is trackable back to the drawing. Dimensions are entered onto a dim sheet allowing any number of lines of entry, insertion of lines between existing lines, deletion of lines and referencing of every line. The dim sheet forces the correct number of dimensions according to the unit of measure for the item. A dim sheet may be nilled so that its total is reduced to zero, but the detail of what was measured remains on record. Factors applying to the subtotal of all lines on the dim sheet may be entered. The quantities on dimensions previously measured as above may be borrowed to create an “And on”. If the total of the original dimension changes, this change is cascaded through to any borrowed dimension.